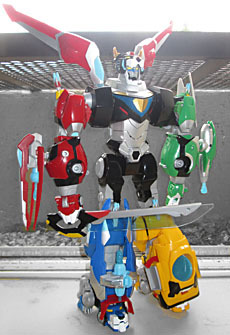 We've diligently reviewed all five of the Voltron lions, so now it's time for the big guy himself. This calls for a transformation sequence! Voltron, a legend 10,000 years in the making. Brought to life by mysterious Quintessence energy, and built to establish peace amd harmony throughout the universe. 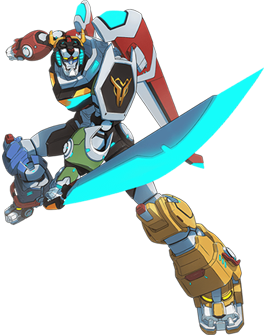 The five lions of Voltron each have their own personalities and abilities, merging with their pilots through a deep psychic connection to unlock unbelievable abilities! Before you can combine the lions, you'll have to transform them. For the arm lions, that involves opening their backs, tucking their front legs into their hollow torsos, and folding the lower legs up into the thighs; the leg lions fold their shins the same way, but also retract their necks and tip their heads back; and the torso, of course, folds its front legs into the shoulders, then opens its mouth to reveal Voltron's face. Despite generally not caring about electronic lights or sounds in my action figures, I did turn the switch on before building the robot. And sure enough, the sounds it makes are unique in both modes: the Lion has roars and laser blasts, but then as you change it into a torso, you hear Shiro calling for each of the other Paladins to form up; then, as you plug each in, its pilot (all voiced by soundalikes, it seems) responds and the commander calls for the next. Even we have to admit that's a pretty good use of the technology, even if it's something that will be mostly ignored. 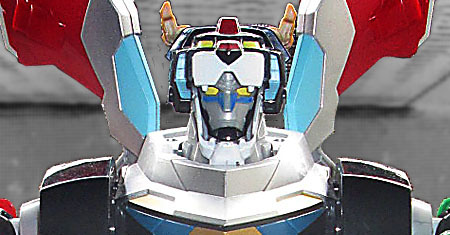 Once assembled, Voltron stands more than 16" tall to the tips of his horns. According to the official size chart, those would be about 300 feet or so off the ground - in other words, the same height as the Statue of Liberty on her pedestal. You know what that means: Voltron vs. Devastator fight go! The show's designers made a conscious choice to stay away from modern (movie) Transformers-style tech, with all the tiny little details all over the place, instead taking inspiration from Gundam and other Japanese robots - mostly big, smooth surfaces. Part of that was because the design had to work as a toy, not just a cartoon, but mainly because that's just the direction they wanted it to go. 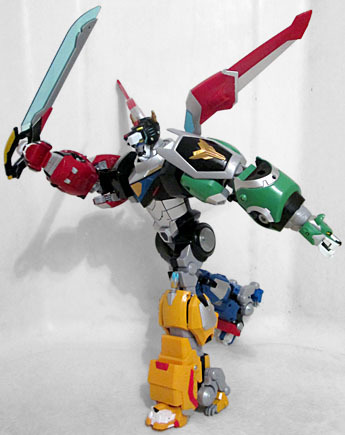 Having to make Voltron into a toy did have one effect, though: since the mecha animation would be 3D, rather than 2D, there was no "cheating" anything in the design; every piece shown had to actually fit where it was shown, just like it would when it was cast in plastic. 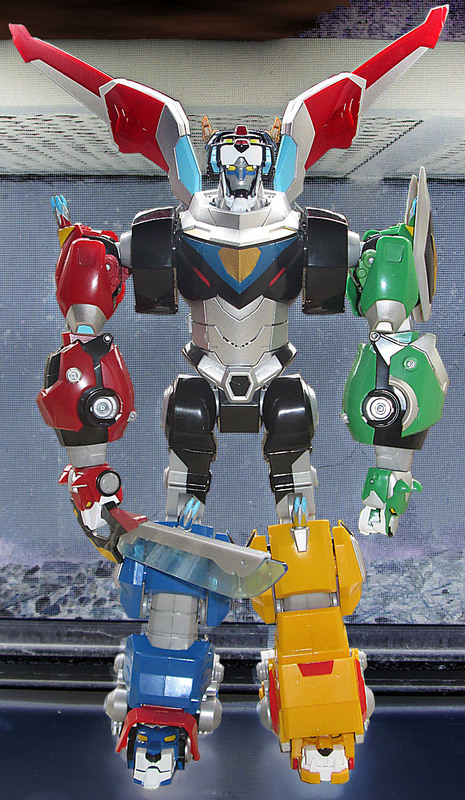 Voltron's heavy, but his big, clunky joints can take the weight. There's quite a snap as they move from one ratcheted position to the next. The robot moves at the knees, thighs, hips, wrists, elbows, biceps, and shoulders. They probably could have had more - a waist, for instance, or the ability to turn the head - if not for the electronics, but this is mostly fine. Why "mostly"? Because the way the arm-lions' legs fold up means they block the elbows from moving properly. That's still doesn't count as a "cheat" in the animation design, though, since if you watch the video up above, you'll see that after plugging into the shoulders, the arms extend slightly - if the toy did the same, the elbows would have the clearance needed to move right. The jaws on the red and greeen lions are spring-loaded, so they can securely hold the blazing sword when they become hands. And of course, the two halves of the sword that came separately with Red and Green need to be combined to form the full sword. We don't get any of the other cool weapons Voltron can form when the Paladins use their bayards, but you can attach most of the lions' big weapons in this mode, if you want to create the illusion of more armaments (the Yellow Lion's disc launcher can't be attached securely, just sort of resting gently in place). 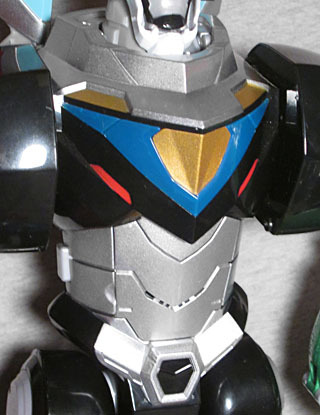 Disappointingly, Playmates still doesn't let us remove the wings to form Voltron's shield. Come on, guys, that should be a given! It was acceptable (or at least "understandable") with the Metal Defender Voltron release, but this figure is larger and more complex, and should do better. Heck, there isn't even enough articulation to get the wings very far up off his back - definitely not as far as the stock images show them going! 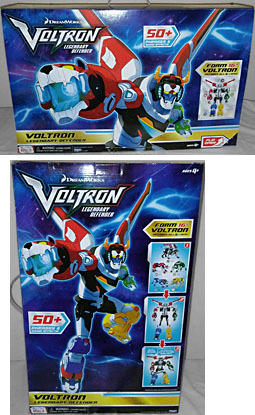 You perhaps noticed while we were reviewing the individual lions that we kept referring to them as "exclusives," despite the fact that they're available everywhere that's carrying the Voltron toys at all. Well, they are, but individually: if you shopped at Toys Я Us, you could get an exclusve giftset featuring all five of them in one gigantic box. (One that, like many of TRU's exclusives from near the end, is now also available at other places, like Gamestop.) The exclusive set included all the same accessories and all the same paint apps - this would have been a wonderful excuse to actually paint the speeders the way they should have been, but no. The set retailed for $99, which was not only a bit cheaper than buying the five Lions individually, it was also the perfect price for those "$20 off $100" coupons TRU sent out on their seasonal giftbook. So I used the coupon on the set, and the purchase pushed me over the top to my final "R Us Rewards" bucks. Thanks, Big V, you're the greatest!